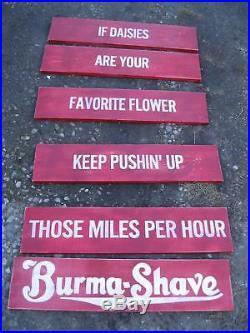 HAND PAINTED VINTAGE STYLE, REPRODUCTION OF THE BURMA SHAVE SIGNS THAT YOU USED TO SEE ON THE SIDE OF THE ROAD. THIS IS A 6PC SET, JUST LIKE THE OLD ONES. 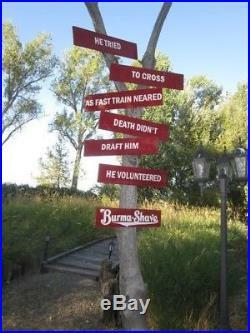 EACH BOARD HAS A PHRASE, THEY WERE STAGGERED ON FENCE POSTS OR POSTS. 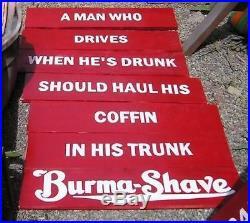 SHOWN ARE 3 DIFFERENT SETS, BUT IF YOU GOOGLE BURMA SHAVE SLOGANS, YOU CAN FIND MANY GREAT ONES. THIS IS FOR A SET OF 6. THESE MEASURE 32 X 7 1/2 \. 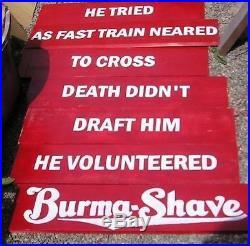 SET 1 READS: HE TRIED TO CROSS AS FAST TRAIN NEARED DEATH DIDN'T DRAFT HIM HE VOLUNTEERED BURMA SHAVE (NOT INCLUDED IN SET) SET 2 IF DAISIES ARE YOUR FAVORITE FLOWER KEEP PUSHING UP THOSE MILES PER HOUR BURMA SHAVE (INCLUDED IN 6 PC SET) THIS SET READS. 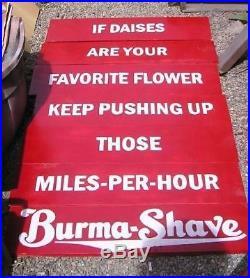 BURMA SHAVE (INCLUDED IN SET OF 6). EACH BOARD MEASURES 32" X 7 1/2". 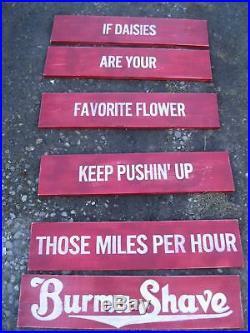 RUSTIC DISTRESSED RED WITH WHITE LETTERING. I HAVE MANY SIGNS TO CHOOSE FROM! >ALL SIGNS ARE HANDPAINTED, AND HAND LETTERED. EACH BOARD HAS IT'S OWN UNIQUE SURFACE AND GRAINS, THERE MAY BE KNOTS IN THE BOARD, OR GRAINY EFFECTS, THAT IS WHAT MAKES EACH SIGN AN ORIGINAL. MANY SIGNS ARE DISTRESSED FOR A VINTAGE LOOK. 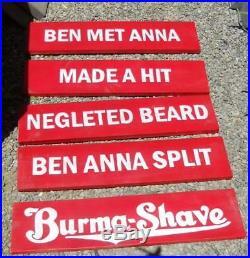 WE CAN CUSTOMIZE YOUR SIGN WITH THE COLORS OF YOUR CHOICE TO MATCH YOUR DECOR. WE HAVE A FULL RANGE OF COLORS, TO COMPLIMENT YOUR DECOR. 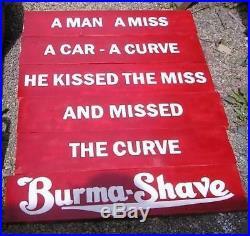 IN MANY DIFFERENT STYLES OF LETTERING AND SIZES FROM SMALL UP TO VERY LARGE. ALL DESIGNS ARE PROPERTY OF BLACKDOG ART. ALL ARTWORK IS HAND PAINTED, WE USE NO TRANSFERS. WE TAKE PRIDE IN OUR WORK.